Good evening and a wonderful steady relaxing day we have had. Posted blog this morning and after Steve and Linda returned from a little shopping we got ready and set off. Twenty yards later we stopped. We set off again and twenty yards later we stopped again. The engine was cutting out once we were underway. Tried another three times then I went in the weed hatch just to check if there was anything round the prop. 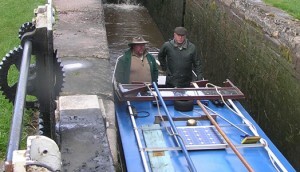 Our intrepid heroes hard at work after Linda had sorted the lock out. There wasn’t so we rang for International Rescue. They were with us in about 25 minutes but we were a little concerned when he was walking up the towpath with what we thought was his sleeping bag under his arm. Oh dear what sort of problem did we have. It turned out to be a roll of paper for wipeing hand and things. The fuel filter he thought. He changed the fuel filter and the air filter, tightened up the engine mountings, stopped the slight fuel leak and checked a few other bits and about an hour later we were underway again. Well worth the £65 annual subscription in this case and no hassle. No major incidents but some very nice countryside, bright sunshine and hail showers. A hall on top of a hill with trees and an agressive swan who attacked Steve while he had been fiddling with something. 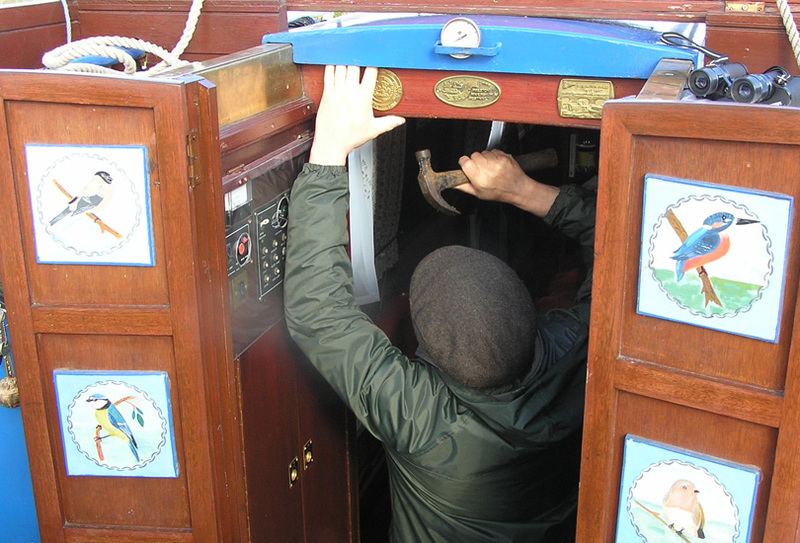 Oh there was one problem as while waiting for the lock to opened I went inside to get some painkillers as I’m having a problem with my shoulder and as I came back up I thumped my head into lintel bit under the metal hatch cover. I said “oh dear me, I don’t think I meant to do that” but at least I now did need the painkillers. Steve just about to hit his thumb while repairing the damaged I did to the lintel. Steve got his trusty hammer and after rummaging through the drawers found some panel pins to tack the wood work back together. I had dislodged it. I have a good head. Though there are those who would say otherwise. We missed the lovely farm and local produce shop at Great Haywood with our delay putting us behind but Linda cooked up some wonderful savoury mince which we washed down with a glass of whisky. I have now worked out about not drinking till the sun is over the yardarm. We now have the lowest yardarm that anyone has seen. Shuggborough Hall is visible from the bottom moorings at Great haywood we were reliably informed but not when the Moscow State Circus has put up a huge marquee. Never mind hey, it’s still a most agreeable place to moor. Will report on the pubs in tomorrows blog as we shall be sampling the facilities in a wee while.